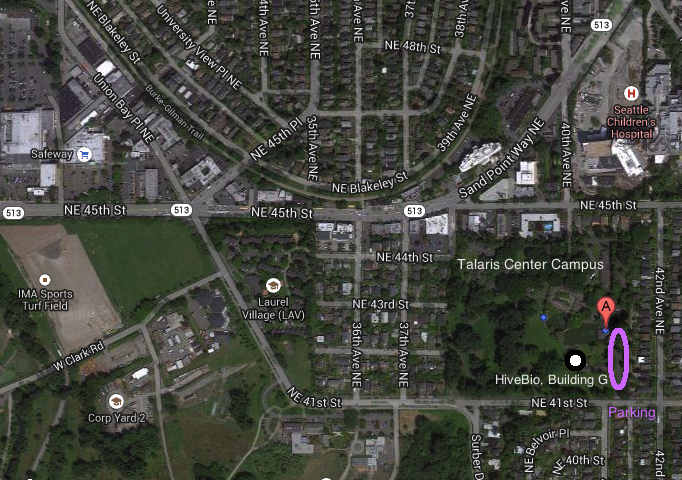 Via I-5 (North or South): Take exit 169 for NE 45th St. Go east on NE 45th St and follow for ~1.2 miles. Turn right onto Mary Gates Memorial Dr NE. Follow road south, then continue onto NE 41st St heading east. The Talaris Center has two entrances. Building G is closest to the 2nd (eastern-most) entrance, the first building on the left. 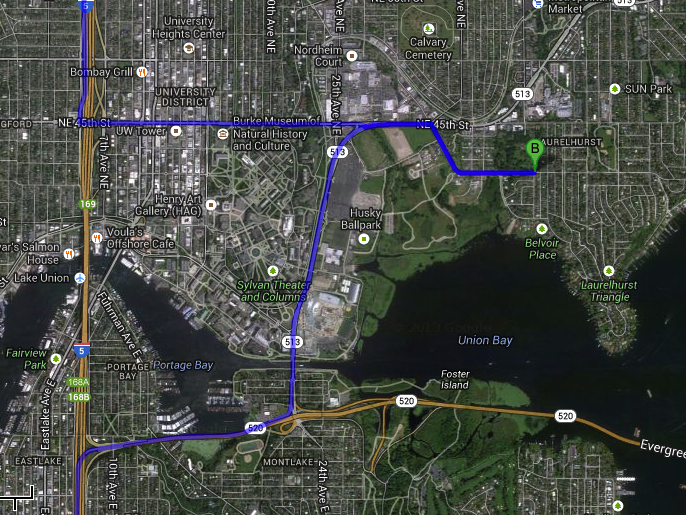 Via 520 (From the South or East): Take the Montlake Blvd exit. Turn left onto Montlake Blvd E going north and cross the bridge. Continue onto NE 45th St heading East. Turn right onto Mary Gates Memorial Dr NE. Follow road south, then continue onto NE 41st St heading east. The Talaris Center has two entrances. Building G is closest to the 2nd (eastern-most) entrance, the first building on the left. Parking at the Talaris Center is free. Enter Building G and follow the signs to the lab. Welcome to HiveBio. What a wonderful idea. I just read about your community lab in today’s Seattle Times. I am a retired board certified clinical chemist and toxicologist with about 40 years lab experience and 12 publications and a patent on some ACE inhibitors. Presently, I am a substitute teacher in the Auburn School District. I would be willing to volunteer. Also, I have a very interesting project for some research that I would like to try to do involving the disease, gout, requiring a pH meter and a chemistry analyzer of some sort. Would you ever be able to do a workshop of some kind for a 5th grade girl scout troop? Want to keep them interested in science as they enter Middle school next year and beyond. Or a series of workshops? Hi Kathy! Thanks for the question. We would be absolutely delighted to! Please email me at hivebio@gmail.com and we can discuss the details. Thanks! My name is Debra Ponds. I have a PhD in molecular biology, and had training at the National Institutes of Health. I was also a post doc at Veterans Medical Facilities at the VA in San Diego. My primary interest is research using 3D cell culture and virology. I am seeking a Fiscal Sponsorship under your 501(c)(3) status per the” Washington Non Profit Handbook” (see attached). I find that our goals are similar, and it would be practical to work together. I have visited your lab while looking for a place that could accommodate my research, and although I love your concept, you do not have facilities for cell culture. Therefore, I decided to build my own lab on the ground floor of my home. Construction is underway, and I anticipate completion in September. The focus of my research is 3D cell culture. Major goals include working with students with learning disabilities, minority students needing mentoring, and students that are just passionate about learning. I will provide a slow paced, relaxed, non pressured, safe environment where they are able to feel comfortable and thrive. Also, once I have achieved sponsorship, I will apply for a Bill Gates grant. Because our goals and ethics are similar, I feel together we can achieve great things for our community. Please contact me about this matter. I am available to meet with your executive board at your convenience. Hi! We are your new neighbors in Building G and I was hoping to talk to someone about your experience so far in the building. For example, I see that the wifi is murderously slow and wanted to see what you did to compensate. Anyway, we look forward to meeting you. We are a small group but hope to grow larger over the next few years. Hello, my name is Seul ki Yeo from Hong ik university in South Korea. My classmates and I are working on a project which is based on Crowdfunding for community. We found Seattle Hivebio Community Lab was built by crowdfunding platform. We suspect that crowdfunding for especially community is the key of enhancing social value in communities, self sustainable growth and also developing special bonds in communities. and your facility is a great example to show how crowdfunding platform affect to community. Since we don’t have that kind of platform in Korea, we would like to learn and have a more educated insight as to how the platform worked for the community lab and how it may be applied in order to make a positive improvement in various throughout South Korea by visiting a great example like HiveBio Community Lab. We are planning to travel there near the middle of July. Would it be possible to interview anyone to explain it to us? We would be grateful for it. I look forward to hearing positive answers. Hi, I am an International student from Malaysia, studying engineering at UW. I would like to know how can I get involved into the events with the minimal fees, I hope I can learn more about biohacking or interesting stuff staying in our body and how can we use it to the maximum extent instead of learning the course at university and sitting for exam sufferring. Thanks!